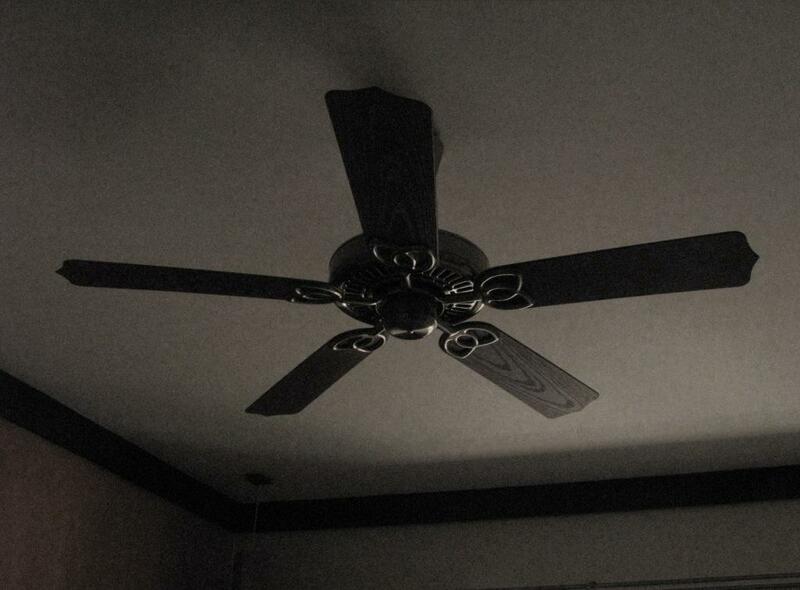 The ceiling fan has been going around far too many times than normal. And at greater speeds than normal. ‘The electricity bill will shoot through the roof’ says the missus, in a tone that has a higher decibel than normal. Cans of juice disappear like discarded cricketers fading from the front page of the normal newspaper. Sweaty shirts and double handkerchiefs are more common than normal. Public tolerance levels are above normal and yet it is quite normal to see normal folks losing their cool. Normal festivals have normal water in colourful glasses. 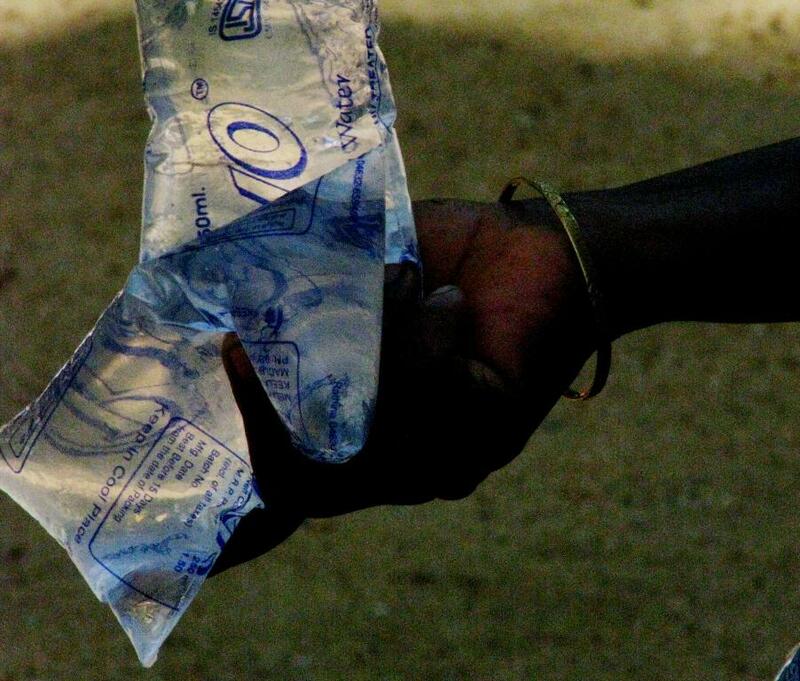 The business of selling packaged water is doing business that is above normal ! Water packets with exotic sounding brands like ‘Cancai‘. ‘Its the last stretch‘, said the normally quiet neighbour to his normally loud wife the other day in a normally dull lift. Received with a grunt of approval that brought back memories of a certain Monica Seles in a normal French Open. Normally, these conversations are beyond my ears. Today, the sun has beaten me down solid and beads of sweat in every inch of visible and invisible skin was sample evidence. Today, there is my imagination runs riot. Which ‘last stretch’ could he be talking about ? The half of the hindi movie that remains to be watched together ? Perhaps its about some interesting yoga postures they are learning together. Perhaps some therapy sessions. Perhaps some bet that they lost because of which they had to wear funny clothes for seven days or something ! Now, he is the bloke who has been living here for far too longer than i. I want to engage him in a conversation about his three air-conditioners that could be reported for noise pollution and he perhaps could get to be their brand ambassador for he never switched them off ! Let alone ask if has gone any centimeter in the direction of Nagpur. Even on a map ! I wonder if he thinks i have some secret hotline to the met department. [ The met department of the ‘it may rain or may not rain’ fame ]. I am still in my trance. And as his wife turns to give me a stare, with a ‘how dare you keep mum after my man has asked you a normal question’ i mumble..
Those medals. They hang from his chest. A chest that seems swollen from a distance. Medals that were won in the military. Many years of serving the nation. If these medals had a mouth of a TV newscaster, they would narrate battle tales. Perhaps. Perhaps. Of war cries and hospital walks. Of wins of territory, and loss of limb. Maybe life. Of bravery amidst blood. Retirement. An able body. A need for family sustenance. And a clutch of medals. These form a neat concoction that provides him employment as a security supervisor at the apartment complex. 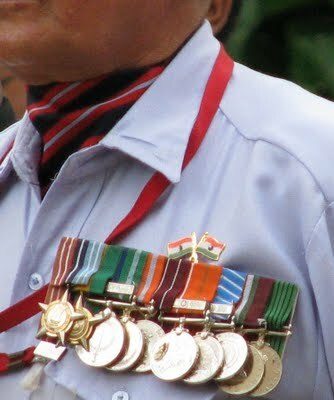 On special occasions, he wears those medals. And walks with a swollen chest. Proud as he is. Of his past. For, every time he wears those medals, the second-grade son of the Vice-President who lives in Flat No : 202, insults him lesser. In a distant small town, an array of medals, trophies, certificates, and plaques adorn an entire cupboard. They keep a lonely mother and father company. They were brought home with great joy by sons, long gone. When these trophies were first brought home, they were brought with tremendous happiness. Awarded for many reasons. Ranging from elocution to essay writing. From quizzing to tennis. From topping school to writing complex code. And other prolific stuff including ‘attending school without a days leave’ to ‘blood donation’ ! Each trophy was treasured. Polished. Shined. And till date, enjoys the attention of visitors. ‘These were brought by our sons’. They say, to people who care to ask, amongst the few that care to drop in. On another note. Big city living has trophies that are in vogue. From the air conditioner to the amplifier. From branded shirts to premium underwear. From the luxury car to Luxembourg holidays. From the digital thermostat to hand wound watches. From cat salons to the digital mouse ! The excitement of the acquisition always compensating the emptiness on usage. For, material trophies atrophy. Simple living. Good health. Shared love. And building a collective future. These perhaps are the trophies that count. These perhaps are the trophies that secretly awe lead runners and podium finishers of the rat race. These are the trophies that will spawn a million memories. Worth more than all the gold with the RBI. And these perhaps are the only trophies that come, atrophy proof ! So its independence day. Again. At the apartment complex. The security guards create the background synchronised movement. With some loud banging of their boots and arching their vocal chords! Children play in gay abandon. And some stare with surprise at the normally ‘normal’ security guards playing ‘statue’ ! Kurtas rub shoulders with Hawaii shirts. And a ‘i love New York’ t-shirt, has the Tricolour pinned on it. Like the one pinned on every other shirt and saree. There is discussion about the water problem and swine flu. But all of that dies down soon. The chief guest arrives. The tricolour hoisted and the rose petals fall. And the National anthem is sung. The tricolour continues to struggle to disentangle and catch the breeze ! And of course, a speech. By the immaculately clad chief guest. A speech that broadly rests on Kargil. On India becoming a superpower. Our pride. The army’s brilliance, the economy’s resilience. There is mention of hunger. Poverty. And such else. A gentle nudge that we all should work towards a greater India. Of course, the sacrifices of ‘our forefathers’ are mentioned. I sigh, as the speech ends. People shout out ‘Jai Hind’. 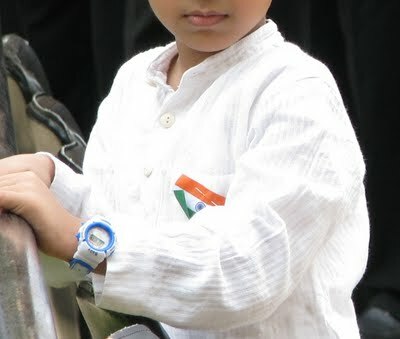 A kid standing close to me, asks her mother, “Mamma is it ‘Jai Hind‘ or is it ‘Jai Ho‘ ” ! I struggle not to erupt in laughter. And then, children sing ‘Patriotic songs’ as the lovely lady compering the event says. ‘Patriotic Songs’ gets the emphasis. Many times. Sure thing, that must be specified. In sometime, i get home. Generally rant, about independence day speeches. About ‘all that empty flowery language and a lack of purpose’ ! That catches me by surprise. But i still bravely list out. Perhaps some stories from everyday lives…. Of teaching children basic manners. The value of money. Water conservation. Closing taps. Treating household help with dignity. Respecting other countries. Other religions. People that are different from us. And i notice, she is already walking away. She turns around. And says, ‘Thank God, you didn’t make that speech. People would have moved on before it ended’. From the other room, she shouts, ‘Now, don’t go put that on your blog’. I think about it. And head here, to post. Heck. Today is independence day ! Happy Independence day people ! There have been numerous ads for new flats going on sale. Enticing they seem, from afar. Only when you go closer, do you realise that the asking rate for these flats is an arm and a leg. From this birth and the next one too. You drop the idea and want to walk away. Only to be enticed into seeing the sample flat. And the salesman wants you to remove your shoe to go inside and look at the sample flat. You frown hoping that he gets the translation of the frown as ‘you must be nuts to ask me to remove my shoe’. Surprisingly it works. He asks you not to bother, and leads you to another part of the room. To this box. 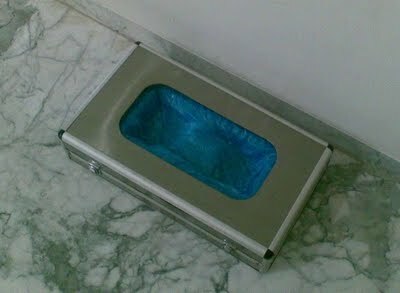 He asks you to put your leg into the box. 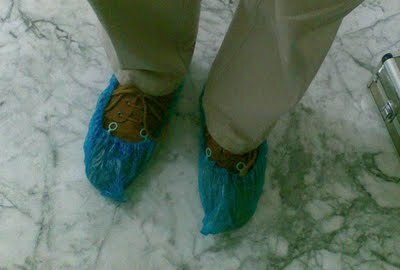 And voila, there is a plastic cover that envelopes the footwear. Like a spiderman web. Or something like that. And tells you that after walking about in those blue semi-transparent overalls, you can discard the plastic and walk away !! And keep your shoes on. You stare open mouthed. The salesman is quick to spot that all his talk about the flat, its layout and features didn’t get you as excited as this plastic vending gizmo. He adds. ‘This is for VIP customers sir. We cant ask everybody to remove their shoes’ ! VIP customer ! You try best to control the laugh. A chuckle escapes. 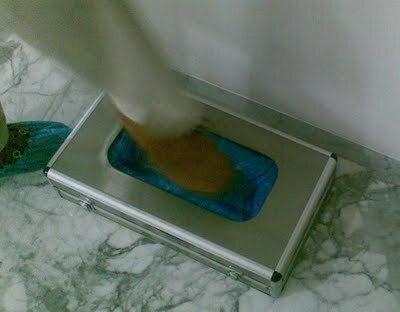 And almost at the same time, he says, ‘In the US this is used in hospitals. Doctors use them’. You are silent. Still struggling to come to terms with a label like VIP customer, and a special distinguishable perk : A blue plastic covering your shoe. And you answer. In a hesitant tone. His swollen chest shrivels. He still smiles. And walks you to the door.You walk with pride. You are a VIP. With a funny blue plastic on your shoe as proof. Fire in the well ! There was this professor in college. He taught us Operations Research. A small man who used to correct papers with that big scrawl that i always thought was an attempt to cover his ‘ineptitude’. I am sure he has more charitable words of recognition for me. And of course, i dreaded his class. One day, just he was distributing the question paper of an internal test, i was girding my loins. I mean, i had prepared. Real hard. And was awaiting the paper. Just as he was all set to distribute the question papers, he tipped a jar of water over the question paper stack. Quickly retrieving the papers with a flourish, he proceeded to distribute a wet set of papers to the class. “So there, a watered down version !” , he said. I flunked that exam. And to this day, think, there was something in the water. Yes. Water. I love water. I treasure water. Every other living summer there has been an impending water scarcity. Or real time scarcity. And then, somehow, the other seasons clamoured to desist from giving the summer a bad name. And it became an all season thing. We are just far too many people and too less water. And the too many people, haven’t been thinking about the far too less water for a far too long time ! 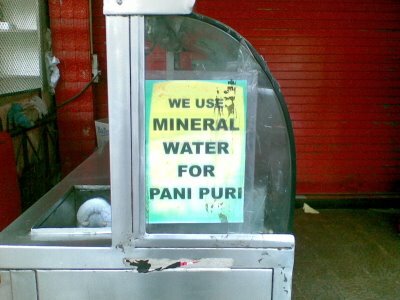 Well, the water scarcity has reached the Mumbai shoreline as well. 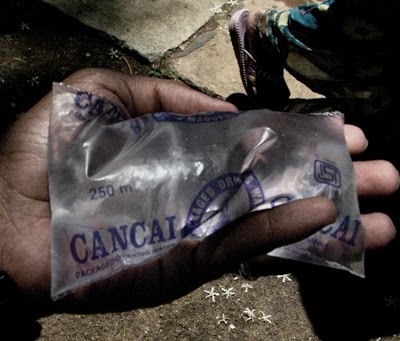 And boy, you have to pay for water these days ! The numerous water tankers (driven by those ordinary men with delusory thoughts that their wheel drives a Mclaren Mercedes and the Mumbai road is a Formula one race track) are proof enough ! And that they do ‘day and night’ service is double proof. Altough, i must confess that ‘self water supplier’ unnerved me a little. 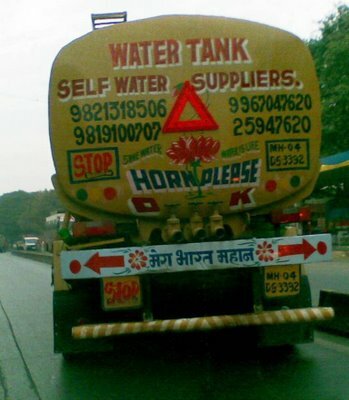 I went around checking what this ‘self water supplier’ meant, just in case. The answers varied, but did not come close to my fears. So. 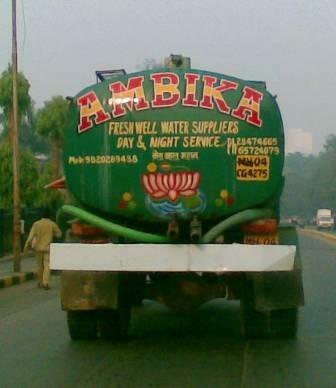 And these impeccable ordinary men and their ‘self water supplier’ tagline, amongst other things, got me started. I resolved that i would speak to as many people in the neibhourhood and educate them about the need to conserve water. With that firm resolve, i stepped outside. There. Right there. Was this kid who was emptying his water bottle in the alleyway. My antennae screamed, ‘opportunity’. So, i thought i’d get my practice going. After being nice to him I told him about the need to conserve water, and thought that the ‘fear of hunger’ would get him thinking. So with a hushed voice i told him, ‘we may not have enough water. Even for food. Your mom cant cook food and you’ve got to go hungry”, i said. And mentally pumped my fist like Boris Becker after executing a neat unplayable backhand cross court volley ! My investigations lead me here. My Water Conservation agenda has since been bristling. Battered down. But not watered down. Yet. And by the way, that Pani Puri left me stirred. And shaken too. The agenda survives. For there is a fire in the well ! Whats On Your Gate ! I am decent chap, you see. Seriously. Please don’t conclude by the quality of the written word on this blog. I really am a decent chap. Ok !?! And so, when friends invite me for dinner ( yes, i do get invited, once in a while), i go. Till sometime back, i went with joy and without any hesitation. The only question that was on the tip of my tongue was ‘Whats for dinner?” These days, that is the last question. If at all we get there. For many a time, i don’t get to go beyond the gate ! For,every apartment worth its home loan balance, leakage and squabbling association, has a string of notices that hang by a thick string at the gate. You just cant miss those signboards. The following are the most common in the area where i live, in the order of occurrences.(Yes. Sure. I did a research). These signs, to put it mildly, amuse me no end. Although, i must confess, sometimes they are downright intimidating. Sample this workplace gate at a workplace near ours. You cant go if you drove an ‘outside’ vehicle. 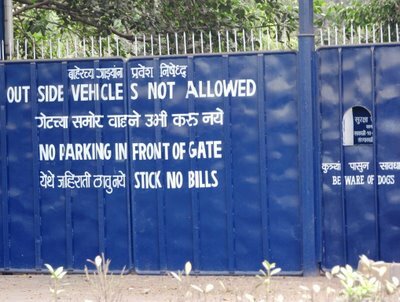 Nor can you park your ‘outside’ vehicle, somewhere close to the gate. And if you are enraged with the entire arrangement, you cant stick a complaint on their face. And if you plan to enter through the side…well, beware of dogs ! I really think we need to start a mass movement to have more ‘welcoming’ signboards on apartment gates. I really think it is time we did that. Signboards that will not make visitors feel like hunted aliens driving a single door UFO with blinking lights and hissing gas. And of course, visitors must feel better than creeps who killed an army of people with twin antennae and a slithering tongue. I know. I know. You think i am taking all of this too far. But, sample this gate that i spotted on LBS Marg. Now, if there was some friend (who is not a relative) who invited me here for dinner, the food he served will not go beyond my oesophagus !! So, in true form, i seethed about ‘positive vibes’ & made random noises about ancient Indian hospitality. And the missus listened. Reserved Parking for the mentally disabled or Reserved parking for people with severe body odour / Reserved Parking for Stolen Cars. hmm… or perhaps, ‘Please keep the engine on. We dry clothes on the bonnet’ ! Or, even better. ‘Smile. You are now on Police CCTV’ ! Exclusive Entry for Red Mercedes 280 SL with Retreaded MRF Tyres. And folks who write ‘Beware of dogs’ can consider writing something common, but specific enough. Something like ‘ We are a quiet neighbourhood. Dogs that bite, seldom bark.’. That would be neat. What say ! And so i continued. 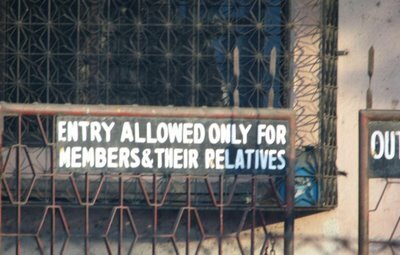 But stumbled when i came to the blokes who have a ‘members and relatives only’ signboard…. ‘Vampires Live Here’, i said. But that was promptly shot down with a shove by the missus. I am still wondering. 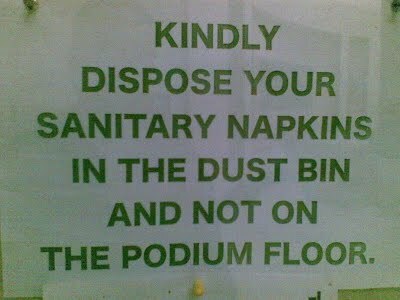 In the interest of the MMWS (Mass Movement Towards Welcoming Signboards), can you shake your brains a little please ?!? My own audacity of hope ! 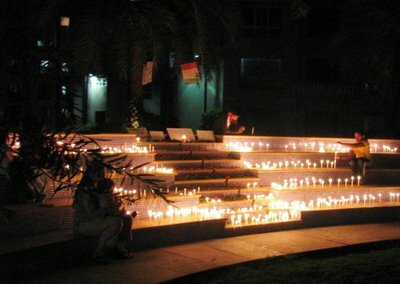 We too, in the apartment complex where we live in, lit a candle in the memory of all those who lost their lives in 26/11. Every neighbourhood worth its square feet rate has done some kind of protest. A peace march. Or some candles lit. And a minute of silence. In our case it was two. Etc. 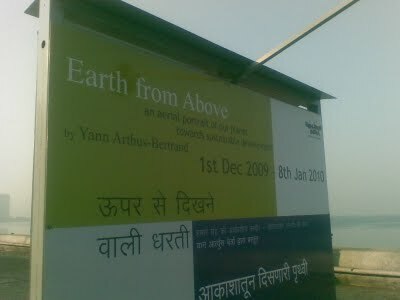 When the notice board bore this message, a mixed emotion prevailed in me ! Of both relief that we live in some kind of a ‘Housing Society’ and a groan that it would be the some candles being lit and chatter about the plumbing system needing overhauling. In the mood for some action, [Concrete Action ], as against Symbolic rituals, as i have been telling friends and whoever who has cared to listen / read. i reluctantly did go. Lit a candle. Said a prayer. And clicked some snaps and here they are. Honestly, it wasn’t all that bad. Well, uncles and aunties chatted up. About the plumber, the electrician and the builder. About the economy, jobs and the share market. About bad gym equipment , paint schemes and the like. The children played. Ran around. And some stuck to their parents. All this, until it was time to light the candles. That was when everybody went ultra quiet. There was some kind of an indescribable collective energy at that point. Post the program as people were moving away, i was privy to some conversations. Just as they were happening aside, and my alert ears caught parts of them. Three are here. 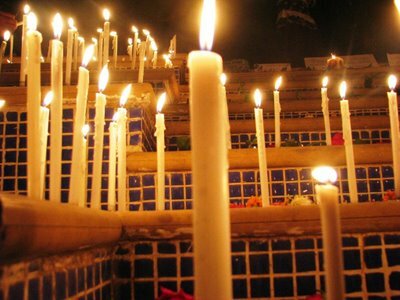 A young boy asked his mom, in all his innocence and babble, ‘ will they be afraid of all of these candles and stop coming here’, well, the mother had to answer him. And an old man walked past me, he said with a quiver in his voice, ‘we must not stop with this’. And the young man walking alongside asked, ‘So what do you think we should do?’ I couldn’t hear the answer. But i guess he had to answer him. And there was this kid, with ‘GI Joe’ written on his T-shirt walk up to his dad, and ask, ‘can i join the Indian army’. I guess the dad had some answers to give. So, in that silence, punctuated by children playing in a far background, it seemed to me like the thoughts were with what happened to us a week back. 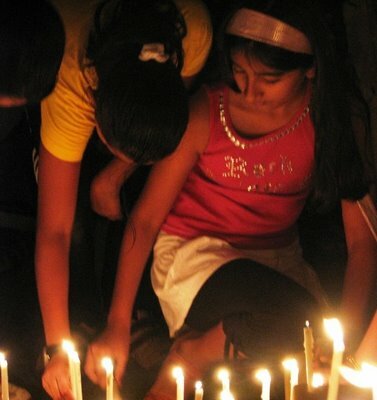 In some time, people started leaving, the candles were flickering away to their ends. 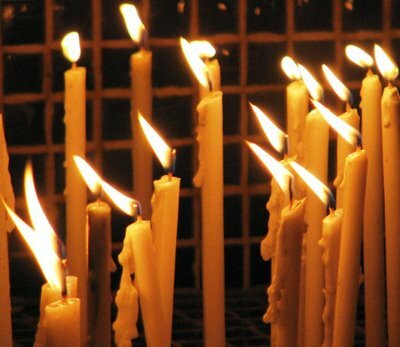 I lingered around , wandering about & hoping that our seeking answers and change didn’t stop with lighting a candle and saying a prayer. We need collective strong, steady, pragmatic action. 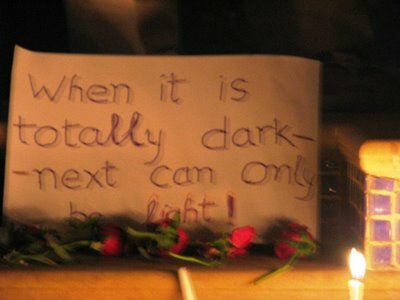 Far beyond lighting a candle and saying a prayer. And in that collective energy tonight, i think, i saw hope. That somewhere our future will be better than the flicker of the lonely candles. ‘What audacity’ you think ?!? Hmm !